creates at times small-scale, at times monumental street art works. 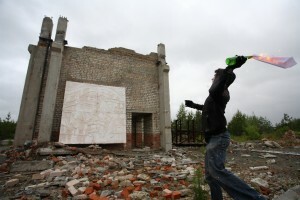 These urban interventions, which started in his native Ekaterinburg, range from “improvements in the hood” to highly critical works. His motto is “anyone who makes street art is a friend of mine”. Born, lives and works on the streets of Ekaterinburg, Russia.